563 Koi Pond Modifications | K.O.I. Pond keeping practices that, when done correctly, can improve a pond's water quality and make it a healthier Koi habitat. Ways to make a pond safer and at a reduced cost. 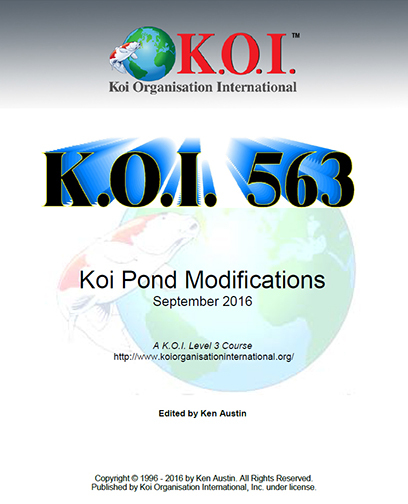 The course material is a document written by Ken Austin entitled Koi Pond Modifications, which is the reading assignment. This is a self-paced course. There will be an exam at the end of the reading assignment. The exam can be taken at any time but all the exam must be completed within the 12 months allowed for the course. Email a request to the instructor a request for an exam and it will be sent to you. Have some fun with this. Koi ponds are often works in progress and can be a difficult task, so the instructor encourages each student to both learn and enjoy the course. Everyone who works hard is expected to complete the course. To complete this course, students must provide satisfactory answers on the exam within 12 months of the first instructor contact. The course must be completed within 12 months of the date the student was initially contacted by the instructor. If additional time is desired, 12-month extensions may be purchased for $25 for a single course or $50 for multiple courses. Students may request extensions from their Student Coordinator prior to the expiration of the time originally allotted to complete their course(s). If the student qualifies and buys an extension, the Store Manager will issue instructions on how to activate the extension.